Don’t Let Winter Cold and Snow Keep You Couped Up: Go SnowShoeing! Winter is here which means more and more snow soon. If you don’t want to exercise inside, you can ski or sled or snowboard. What about outdoor exercise for hikers and those that don’t want to travel to downhill ski? Snowshoeing is becoming a popular way to get some cardiovascular workouts and the Chicago area Forest Preserves area available all winter! Don’t have experience snowshoeing? Read the following excerpt from the “First-Timers Guide to ShowShoeing” below from SnowShoeing Magazine to learn all you need to know to get started! There is no better way to begin snowshoeing than just going and doing it. Take a risk, rent or buy a pair of snowshoes, dress for the elements and enjoy. However, that’s just a start – there is more to it than just taking a refreshing plunge in some snow. Snowshoeing has been around for thousands of years. And, obviously, the art of snowshoeing has become more sophisticated over time – now it’s considered a winter sport. From the early wood-frame to the aluminum-frame models, snowshoeing has garnered quite a following throughout the world. Modern day snowshoeing is made up of casual snowshoers who hike trails for pleasure, the snowshoeing enthusiasts who trek through the backcountry, and the competitors who race. Considering this is the fastest growing winter sport in the world (snowboarding is growing fast too, but not fast enough), snowshoeing is poised to become a monster of a market. Many involved in skiing and snowboarding utilize snowshoes to participate in some great backcountry hikes to find the holy grail of mother nature: Deep, unscathed powder. Snowshoeing is a great alternative for many sports – especially those who like running. The sport is easy to learn, virtually inexpensive (compared to other winter sports), poses little risk of injury and is a great way to exert energy during the cold winter months. According to research provided by Snowsports Industries America (SIA), 40.8 percent of snowshoers are women (a number that is increasing rapidly), 9.4 percent of snowshoers are children (ages 7-11), and 44.2 percent of snowshoers are ages 25-44. One of the more appealing facts about snowshoeing is how it can help enrich a person’s health. Known to help maintain or improve cardiovascular fitness, the sport helps burn more than 600 calories per hour. Snowshoers can burn more than 45 percent more calories than walking or running at the same speed, according to SIA. Snowshoeing is a great way to pursue losing weight. 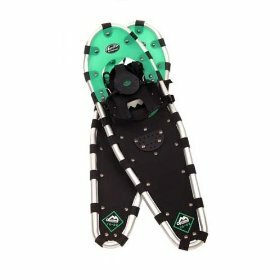 What to Look For in a Pair of Snowshoes? There are three types of snowshoes available: Recreational Hiking, Aerobic/Fitness and Hiking/Backpacking. • Recreational hiking snowshoes are a basic selection and are perfect for first-timers. Usually, these snowshoes work best on simple terrain that doesn’t require a lot of steep climbing or descents. Snowshoes for aerobic/fitness are best suited for those who are active snowshoers – like runners and cross-trainers. This type of snowshoe has a very sleek design and is generally tougher than most available. • If you like the powder and are more experienced with snowshoeing, purchasing a pair of hiking/backpacking snowshoes is your ticket. These are as tough as they come: Strong aluminum frame, durable material for flotation, and bindings that support all types of boots. • The cost for a pair of snowshoes is generally inexpensive. Look to spend on the low-end around $100 and on the high-end around $300 (sometimes higher depending on the manufacturer). • Many retailers will offer a package deal that will provide poles and a snowshoe bag. These are generally good deals, but pay particular attention to the type of snowshoe you will be receiving. If you want to do some backcountry snowshoeing, a starter kit won’t be the best option. Ask your retailer for more details. • It is highly advised not to purchase a used pair of snowshoes. If you decide to go through with buying a used pair, inspect them thoroughly: Check the frames for damage (including chips), check the bindings for overstress and check the flotation material for holes and rips. Know who you are buying your snowshoes from. Don’t get caught in the backcountry with a faulty pair of shoes. • Finally, as one of the most important factors in snowshoeing, choose according to the size available. Usually measured in inches, the length will depend upon how much you weigh. The most common sizes (excluding kids lengths) are 25 inches, 30 inches and 36 inches. Your retailer should be able to help you when deciding snowshoe length. Where to Buy or Rent a Pair of Snowshoes? There are plenty of snowshoe retailers to choose from. However, there are more obvious choices than others. For example, REI and Eastern Mountain Sports (EMS) sell snowshoes around the nation – they are the obvious retailers. The less obvious retailers are independent stores that may include equipment for running and local mountain outfitters. If you really want a nice selection of shoes to purchase from a retailer, visit Backcountry.com: Click here. Backcountry.com is the place to buy not only snowshoes but accessories as well. They also have great prices on certain brands, models and snowshoe starter kits. Where Should You Go Snowshoeing? If it’s covered in snow…go for it!But, be careful. Don’t take risks and most importantly, have fun. The prime areas for snowshoeing are at nordic centers, which are usually placed in or around a ski resort. Other types of snowshoeing destinations include bed and breakfast inns, mountain lodges, state parks, national parks, snow-covered golf courses, open space (provided by your state government), ski slopes, and much more. Although many people like the individuality and peacefulness of snowshoeing, it’s a good idea to snowshoe with a friend or partner. And, bring a global positioning system (GPS) device and a compass to help better navigate remote and wooded areas. Please note: Remember to bring plenty of water or a water filter on your snowshoe travels. Read entire article from the “First-Timers Guide to ShowShoeing” below from SnowShoeing Magazine here. What Type of SnowShoes Do I Use? I recently bought a new pair of snowshoes from Amazon.com and plan to hit the trails as soon as there is more snow!